The success story of the Porsche RS Spyder continues: At the Le Mans 24 Hour race, the Essex team (Denmark) celebrated a clear victory in the LMP2 class. The 440 hp sports prototype from Weissach also won the energy efficiency classification “Michelin Green X Challenge” as the car with the best overall efficiency, calculated by the ratio between lap times and fuel consumption. The RS Spyder of the Danish customer team beat its rivals in the LMP2 class by 15 laps. One hour before the end of the race, the RS Spyder of NAVI Team GOH spun off the track while running an easy second under braking for the first chicane on the Hunaudières straight on an oil spill of a competitor, hit the barriers and retired. The Japanese driver Seiji Ara was uninjured. “We’re proud that in customer hands the RS Spyder not only confirmed its high speed and reliability again but also won the environmental classification. It’s such a great pity that the second RS Spyder retired. NAVI Team GOH put in an immaculate performance and really would have deserved to secure second,” said Porsche Head of Motorsport, Hartmut Kristen. In 2008, the RS Spyder won the energy efficiency challenge at all races and championships – in the Le Mans 24 Hours, the American Le Mans Series and the European Le Mans Series. With this, the RS Spyder impressively underlined its status as the world’s most efficient sports prototype. After a break of four years, NAVI Team GOH, Le Mans winner of 2004 with Seiji Ara, looked like they would bring home a safe second place right up until an hour before the flag – with a ten lap advantage over third position. Oil from a competitor became Ara’s eventual fate. “I had no chance. Two wheels hit the oil that I couldn’t see while braking,” said Seiji Ara. “It’s a bitter end of a great race. I’m pleased that the RS Spyder is not only fast, but also safe.” His compatriot Keisuke Kunimoto contested the long distance classic for the first time. Porsche works driver Sascha Maassen was full of praise: “I salute our team’s performance. Perfect preparation, perfect team work in every respect. I’m so sorry that we couldn’t bring home the success they deserved.” For the perfect work in the pit stops, the team received a special prize from the organisers. Porsche works drivers Timo Bernhard (Germany) and Romain Dumas (France), lent to Audi for the Le Mans 24 hour race, lost all chances to win with a technical defect in their #3 Audi R15 TDI which resulted in repairs over several hours on Saturday night. With their chase through the field from the back to finish 18th, the two shone with their excellent lap times. “It hurts to be out of contention for overall victory so early on,” summarised Bernhard. “Still, it was great fun. The Audi crew made us feel very welcome from the first moment on,” added Dumas. 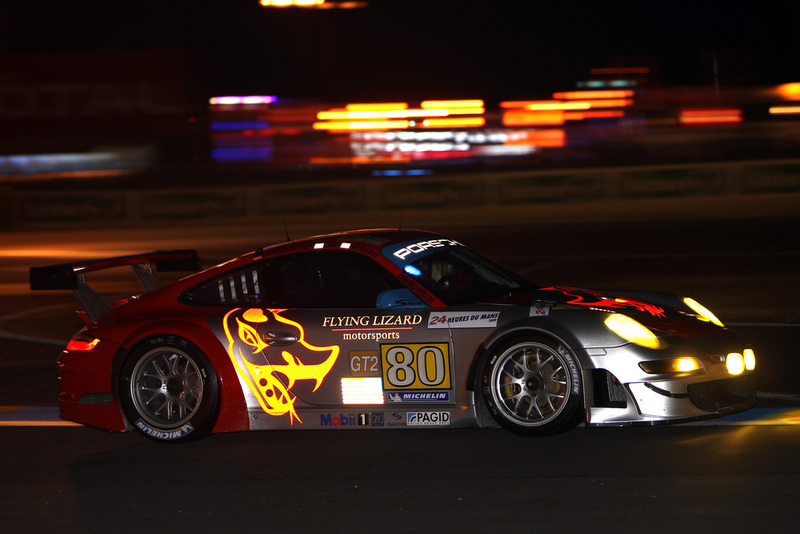 For the American Flying Lizard team, the 2009 Le Mans race ended in the early morning hours when Darren Law (USA) collided heavily with the barriers. 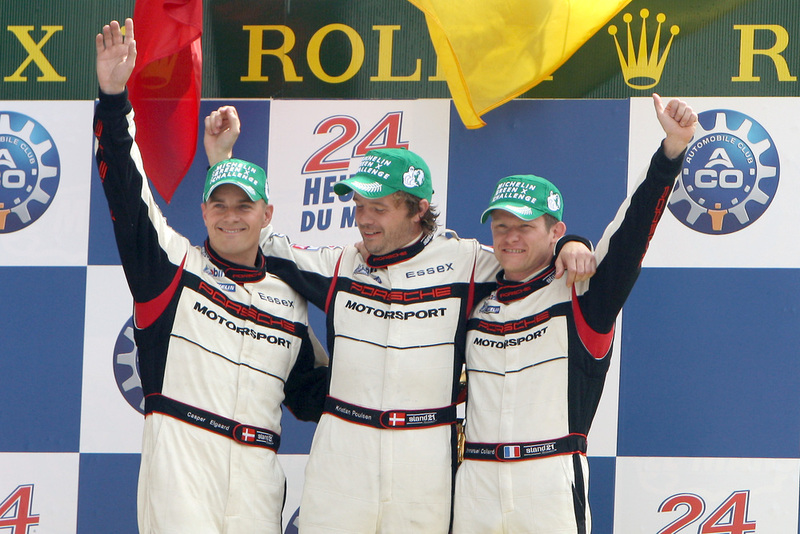 Prior to this, pole-setter Jörg Bergmeister (Germany) and team owner/gentleman driver Seth Neiman (USA) were steadily moving in the direction of a podium result with their GT3 RSR. The French IMSA Performance Matmut team with Porsche works drivers Patrick Pilet (France) and Patrick Long (USA) as well as Raymond Narac (France) maintained third place for more than two-thirds of the race distance. On Sunday morning a problem with the power transmission put an end to their promising charge. It was painful to watch Flying Lizard #80 hit that barrier, I was really hoping to see them over take Risi Ferrari and win the class. @Mark, I agree. I was, however, very happy to see that Darren was okay!! I wonder though, how things would have gone had Darren not crashed? How much time had Seth spent behind the wheel? Would that have made a significant difference? ?